Brothers, Max and Dave Fleischer began their career in animation shortly after World War I as chief rivals to Walt Disney at Columbia and later United Artists. Under the banner of Paramount, they created a number of characters, including Popeye and Betty Boop. Before the Hays Commission came into power, Betty was the symbol of the flapper era, wearing short skirts with garters showing. After the Hays Commission, Betty, like the rest of Hollywood, was censored and she began to be drawn with longer skirts. Here, she is seen with Henry, "The Funniest Living American," from the comic strip of that name, in his only animated appearance. Owning a Betty Boop one sheet is one of the pinnacles of collecting animation posters, as very few are known to exist. 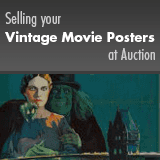 In excellent condition, this poster only needed touchup to light surface paper loss along the top vertical fold. Very Fine- on Linen.